Indian Leading Market Place Shopclues is Back with Amazing Discount Offer. 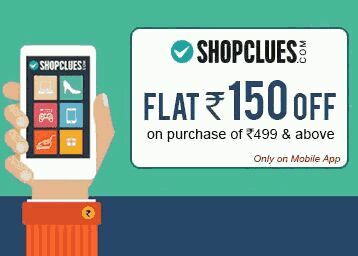 Where you get Flat Rs 150 Off on Purchase of Rs 499 or Above. So Grab the Offers before you t expires! • Do the payment and place the order. - Get Flat Rs.Rs 150 Off On Purchase Of Rs.499. - Offer Applicable On Non Electronics Products Only. - Offer Not Valid On Electronics, Mobile & Mobile Accessories, Gold Coins And Bars, Precious Jewellery, Gift Coupon. Offer Cannot Be Combined With Any Other Offer. - Maximum Discount Of Rs.150 Can Be Availed. - Apply The Coupon Code To Avail The Offer.